Skin is the biggest organ of the body, and its primary function is defence! Environmental elements, food, parasites, and hormonal conditions have the ability to weaken this defence system. By learning to detect early symptoms, many diseases of the skin can be treated and controlled. A bacterial infection causes one of the most common skin conditions. Bacterial infections may be secondary to an allergic reaction, from both environmental and food exposures. When the skin barrier weakens and breaks, it allows for bacteria to invade. 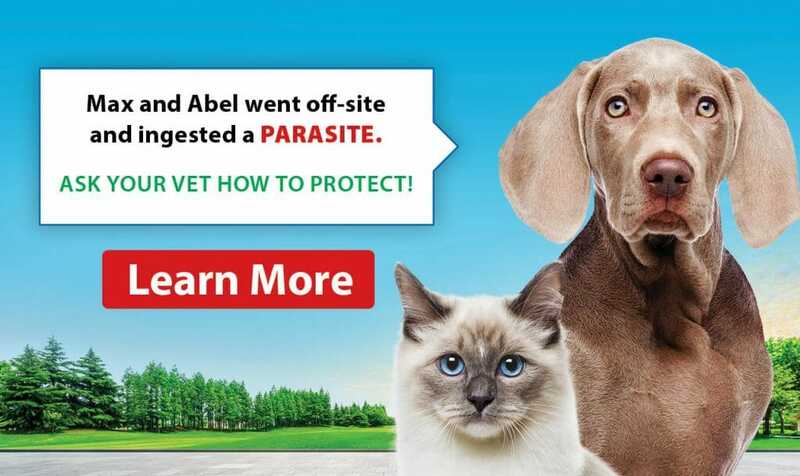 The symptoms of this condition may include but are not limited to red, raised, moist patches, which are itchy and uncomfortable to your pet. This condition is diagnosed through a physical exam, as well as a microscopic examination of skin samples collected from affected areas and examined under a microscope. What are the causes, symptoms & diagnosis of ringworm? Did you know that ringworm is not a worm? It is a fungus that is zoonotic, meaning it can be transmitted from animal to human, or human to animal. The symptoms of this condition include red, raised lesions usually in the shape of a circle. These lesions are usually itchy and may cause hair loss at ear tips and on the flank. This condition is diagnosed through a physical exam and is confirmed with a fungal culture. Certain ringworm species will glow neon yellow under a UV light. Allergic skin disease is a chronic yet controllable condition. During an allergic reaction, mast cells release an agent called histamine which causes flare-ups of the skin. 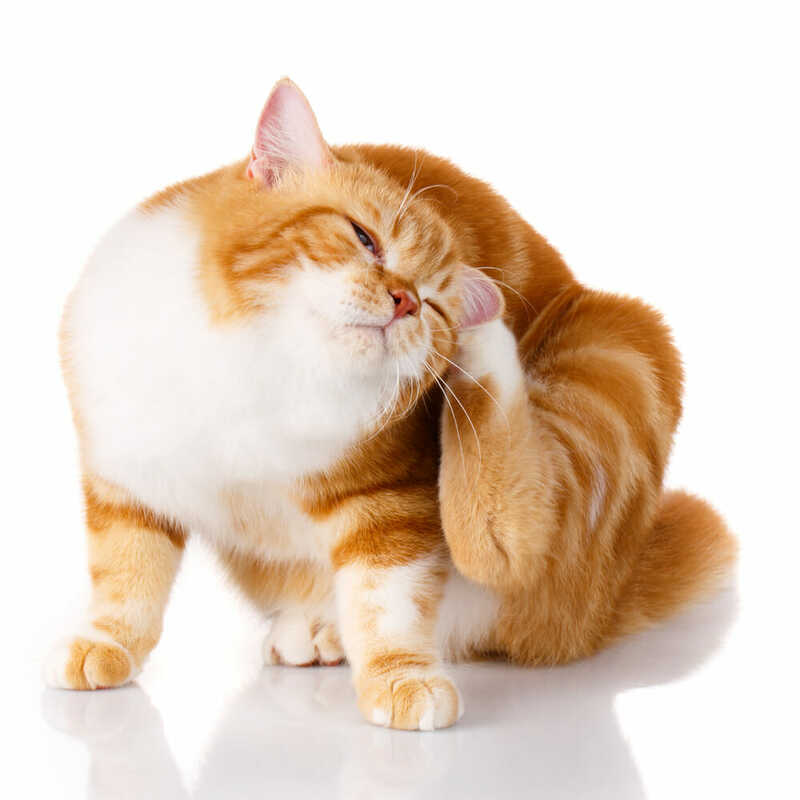 These flare-ups can be presented as red bumpy skin, consistent licking of the feet and belly and the possibility of ear infections. This condition is diagnosed through a physical exam, followed by treatments of underlying infection and the potential of a dietary food trial to help pinpoint the allergen. A parasite is any living thing that lives in or on another living organism. Parasites depend on their host for food and shelter and may spend their entire life on that host. With parasitic skin disease, specific parasites such as Demodex live their entire lifecycle in the hair follicles of their host. You can see the disease in two forms: localized in a small area, or generalized where the majority of the body is involved. Symptoms include hair loss, reddening of the skin, scabbing, crusts, and sometimes itchy skin. Secondary skin infections can be caused by the damage done by mites. Diagnosing parasitic skin diseases are done by examining debris from skin scraping under the microscope. Hormones are chemical messengers that have many different functions and are wide ranging throughout the body. Specific organs such as the pituitary glands and thyroid gland when off-balance, can cause a broad range of skin disease in dogs. Hypothyroidism is caused by a reduction in the thyroid hormone. Symptoms include dryness, excessive shedding, sporadic regrowth of hair, hair thinning and hair loss (usually bilateral) on the stomach, thighs, tail and neck. An overactive pituitary gland may cause signs of hair loss, darkening of the skin, secondary skin infections, flaky or greasy skin, and thinning of the skin. Diagnosing these conditions starts with a physical exam, followed by recommended blood work panels.